Right on the heels of Cyclone Nargis in Myanmar came news of another equally shocking and destructive natural disaster in China. The very first reports of the devastating earthquake centered on the destruction of schools and the resulting loss of many young lives. The quake left many families without children—particularly because China enacted a policy in 1979 that restricts families to having just one child in an attempt to help ease the pressures of a fast-growing population. The Chinese government is now ensuring that families who had a child killed or disabled by the earthquake understand that they are allowed to have one more child, as reported here. Why was China’s birthrate so high before this policy was implemented? Japan has no one-child policy, yet its birthrate is relatively low. What is the difference between these two countries in this regard? In a developing country (as China arguably still is to an extent), markets for retirement savings and pension funds are often absent. To compensate for this, parents must count on their children for support later in life. And a couple must decide how many children they need to have in order to be reasonably certain they will be supported. This is determined in part by the couple’s attitude towards risk, and when it comes to security in old age, it is reasonable to assume that most people will be quite risk averse. To assess the risk of ending up alone and destitute in their old age, they need to estimate the probability, given current economic and social factors, that any single child will provide old-age support. Assuming the child lives into adulthood, he or she must earn enough income to be able to provide support, as well as being willing to do so. Furthermore, if only men have the earning potential needed to provide financial assistance, the necessary number of children will double. 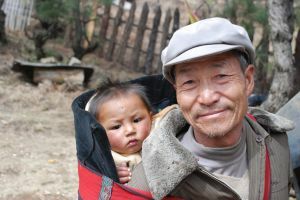 Facing these risks, couples in developing economies often choose to have larger families than needed for the sake of old-age security, leading to relatively high birthrates. China’s one-child policy was meant to curb this trend. 1. The opportunity cost of raising children is another factor that influences birthrates. Women in China (particularly rural China) face fewer employment opportunities, and at lower wages, than women in Japan. How does this help to explain the disparity in desired number of children between the two countries? 2. Will a grown child be able to support two elderly parents any better than a single parent could provide for him- or herself and two young children? How might this problem be magnified further with multiple generations of only children? 3. Has China’s one-child policy been a success? Why or why not? What unintended consequences might result from this policy? While reading this article i see that the original law is terrible. With the law the population would cut almost in half if families fallowed it. It takes 2 people to create a child and if there is only one child when the 2 people die they have only left one kid. This law should be removed. This law would also greatly affect the economy. When older workers retire from their jobs there will be fewer people to take their place. Business will have to pay more money to hire these people because supply will be decreasing. Also because there is less people hired efficiency decreases and causes loss in the companies income. Although unemployment will be at an all-time low, it will hurt the economy. Is it possible for a large scale cost-benefit analysis alike? Also regard to the previous comment, population has no direct link to efficiency.so it is fallacious to say that less people results in decrase in efficiency.